Acid reflex indigestion is an uncomfortable and painful health condition. * Consuming rich foods, fried foods, carbonation (soda, beer, sparkling water) poor food combining. * Eating before bed - avoid all foods at least two to three hours before bed. * Incorrect food combining. Personalized program to eliminate Acid Reflex, Heartburn and other digestive orders - designed for you by Dr Suzanne Stuart, PhD ND. * Drinking unhealthy beverages i.e. soda, milk, alcohol, V-8, fruit juices, etc. * The water you drink greatly affects your acid levels. Most water is acidic at 5.5-6.5 pH, especially tap water and many bottled water (such as Ozarka or in plastic bottles.) We have tested numerous brands and types of waters. * Tissue damage, Esophageal irritation, Asthma, and potentially Cancer. Alter your dietary habits to Prevent, Reverse or Cure Acid Reflex and other indigestion problems. * Eat meals earlier in the evening, many hours before bed. This prevents acid accumulation, which ages the body. * Avoid rich foods at fancy restaurants or at home late at night. Rich Foods especially at night - sugary sweets, fatty foods: red meats and Dairy: creams, cheesey, buttery, ice cream, etc. * Fruit intake can cause or contribute to acid problems. Avoid all fruits in the evening hours. Avoid fruit intake with any other foods before, during or after the meal. The quantity, type and combination of protein, grains, vegetables, fruits, sugars, spices and salt must be suitable to your body type. * Consume more vegetables - 50% of diet must be vegetables. Corn and Potatoes are not veggies. * Drink fresh pressed vegetable juices - they contain appropriate levels of alkaline, live enzymes,minerals, amino acids and vitamins. * Avoid the pre-packaged or canned veggies and fruits or juice beverages. * Drinking more alkaline water benefits your whole body and generates an ongoing healing process. Absorbing alkaline water as well as oxygenation along with maintaining a positive attitude is essential for rapidly reversing unhealthy conditions. Contact us for FREE information about the best quality Alkaline Filtration system with long term warranty program. We have researched numerous Alkaline Water Filtration systems and can share this information with you. Do you live an acidic lifestyle? Do you experience mental, emotional or physical Stress in business or personal life, relationships or health? Stress is acid forming and aging to your overall health including your Heart, Stomach, Kidneys, Adrenal glands, Thyroid, Brain and more. See Dr Stuart to assist with elimination of digestive problems. Empower Yourself! Health & Weight Personal on-line consultation,information & remedies to improve your well-being - Author/Naturopathist Dr Stuart, PhD ND. 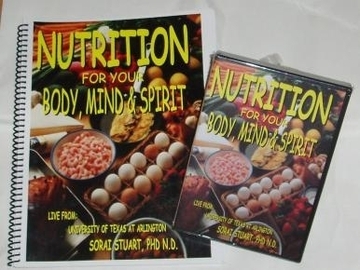 OBTAIN the Life Changing Book "Nutrition For Your Body Mind & Spirit" Guaranteed to Prevent, Reverse or Cure health ailments. Life Changing Book "Nutrition For Your Body Mind & Spirit" Guaranteed to Prevent, Reverse or Cure health ailments. Ten Hour CD audio Plus Companion Book.